I love One Kings Lane. I'm a subscriber even though my wallet can't afford them. That makes me a One Kings Lane window shopper. ;) It also provides some much needed inspiration! So imagine my surprise when I happened upon this beauty late one night. And then my gasp when I looked down and saw that price tag. $2295- Wowzers! I couldn't resist so I peaked...somebody apparently has that kind of money because it has already sold. Can you believe that I had one of these sitting unfinished in my garage? Yes. The. Same. Exact. Dresser. 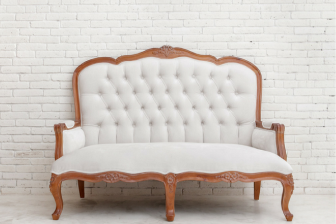 This beautiful piece was refinished in Chalk Paint® decorative paint by Annie Sloan in Old White and the hardware received a good Brasso cleaning. Thanks for the inspiration One Kings Lane! Now, it's your turn.. go and create something for YOU! Gorgeous! You did an awesome job! Thank you for the lovely compliment, Alli! Well this is an amazing transformation! Bravo! Thanks so much for sharing at Monday Funday! Well hello gorgeous is absolutely right! And the gold on the handles makes it shine even more! Great Balls of Fire...how COOL to have that same dresser in your storage...and, girlfriend, you did an amazing job on painting. Very pretty. What a gorgeous makeover! Thanks for sharing it at the Vintage Inspiration Party - I pinned it! This piece is beautiful! The inspiration piece is lovely and you did a fantastic job with yours. Thanks so much for sharing on Snickerdoodle Sunday. Pinned and Tweeted. Thank you for sharing, Beverly! I love One King's Lane too, but have the same wallet problem! :) But this is brilliant and turned out so well. 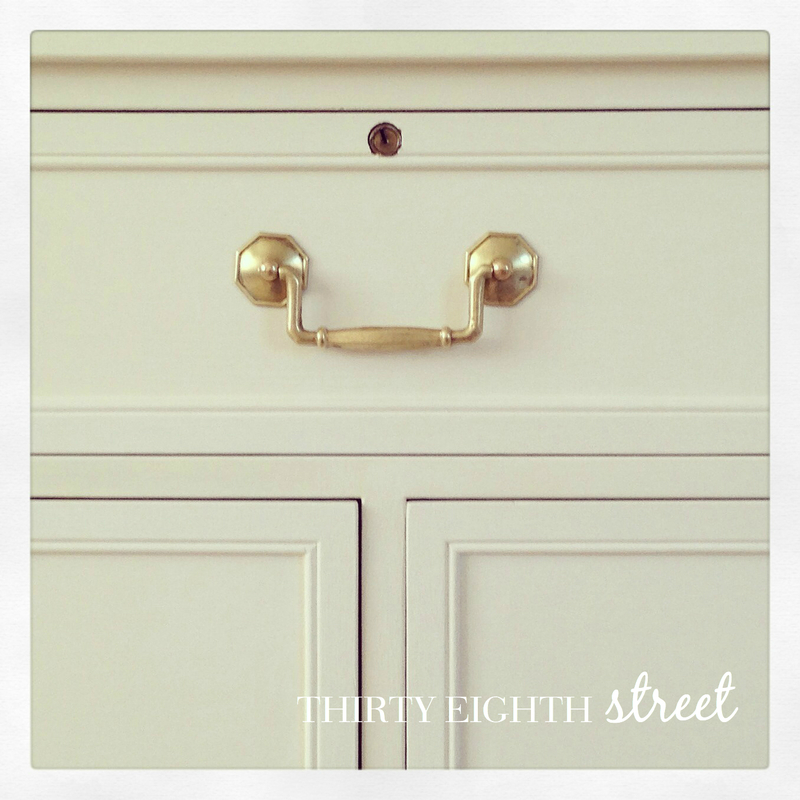 Love the brass hardware and little feet! Wow! I can't believe the price tag on that dresser! Your's look better and that chalk board is stunning! Thank you for sharing at Dream. Create. Inspire. Link! 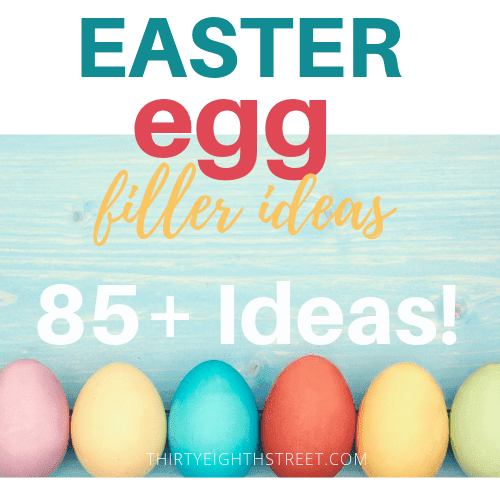 I'm pinning your idea! Gosh! Thank you! I'd love to come back again! That is gorgeous! I love One Kings Lane too and have only admired the furniture on their site. 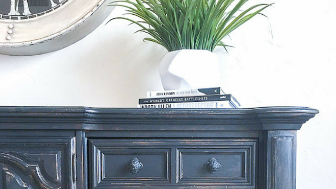 You did an awesome job recreating the $2000+ dresser and it looks exactly the same. Thanks, Erlene! You made my night! I love this. I must sound like a broken record, I say the same thing every time I come here, but it's true! I think you live in my head and see all the things I would love to have, and you make them, I just don't have your creative hand or the vision to see it! Wish you lived closer! Thanks for sharing at #WAYWOW pinned and shared on Facebook, love your work. Ok I have to admit I am a One Kings Lane window shopper as well, so I totally appreciate this makeover. Their prices are just a tiny bit to high for me. Your makeover seriously looks like the exact same piece. What a lucky find. Where was the dresser originally from? Was it a hand me down or craigslist find? Thanks so much for sharing at the Creative Circle Link Party! Wow, what an amazing transformation. 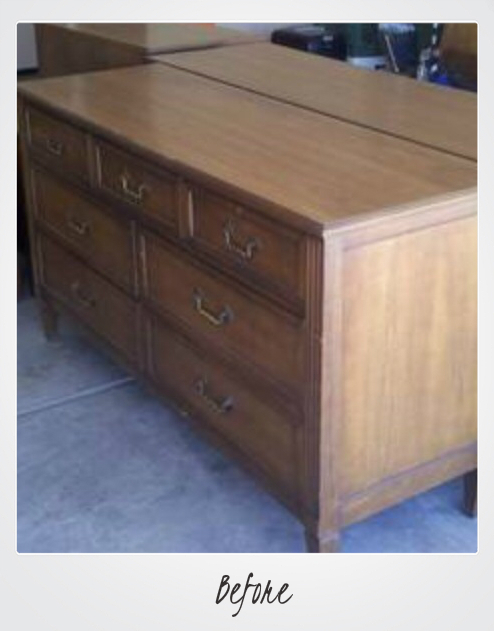 I'll take your version any day, I can't even imagine paying that much for a dresser. 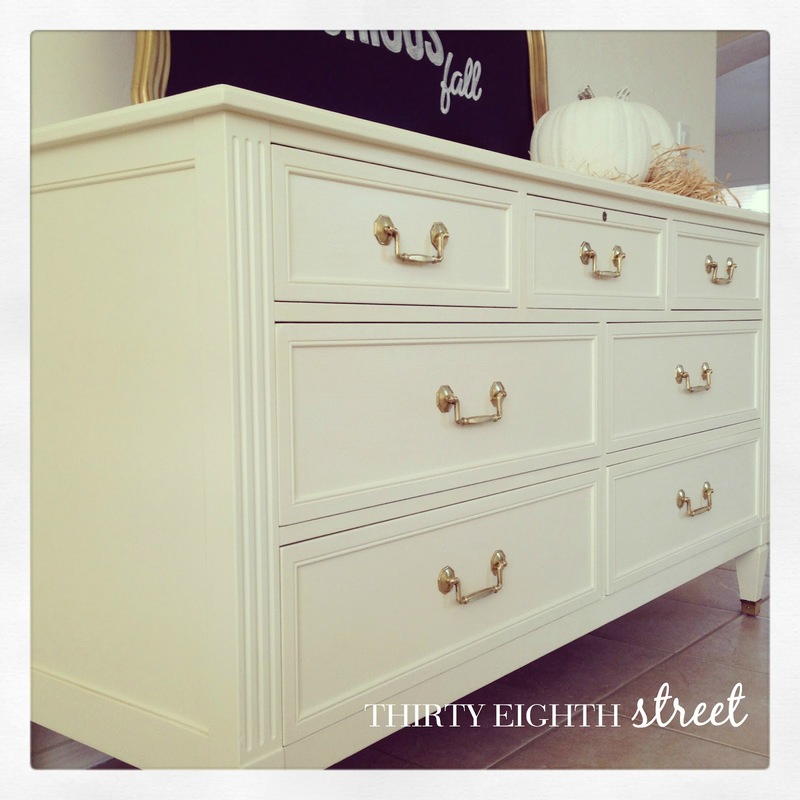 Thanks for sharing your thrifty makeover at Vintage Inspiration Party. Me either! ;) Thanks, Betsy! 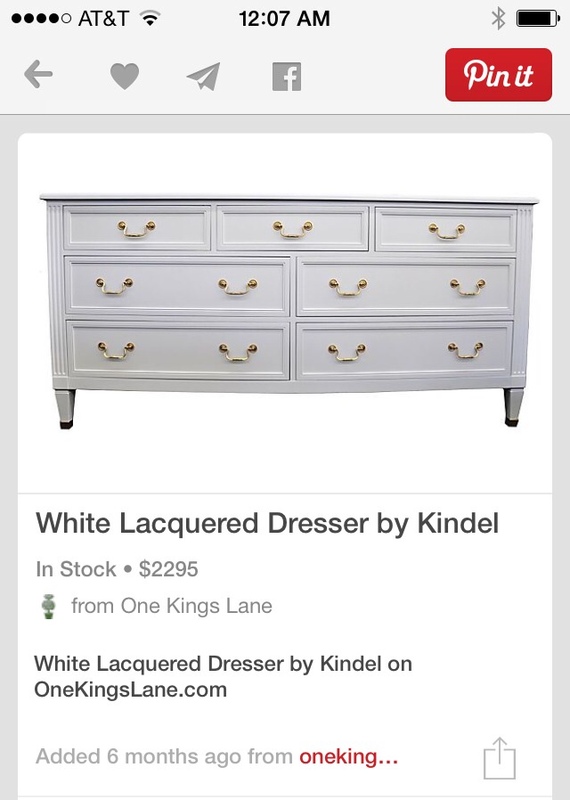 I've never heard of One King's Lane but that dresser is so lovely...and I am in complete awe that you had one already! You made it over so perfectly...! Thanks for sharing at the Welcome Home Wednesday link party...we really hope to see you again this week! Wow!! 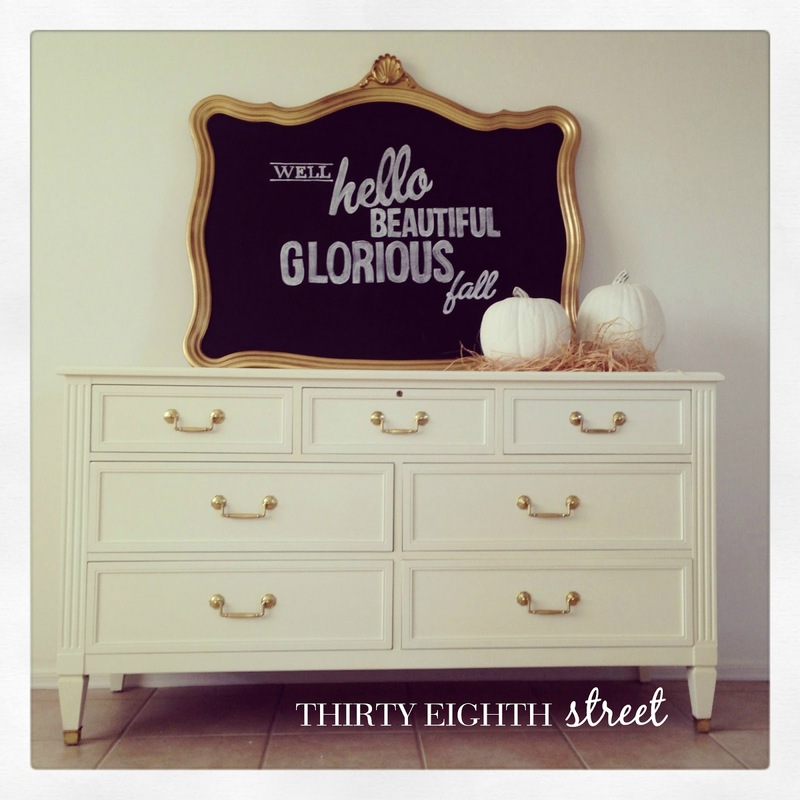 I love the way you made over that dresser and an even bigger score because you already had the dresser!! 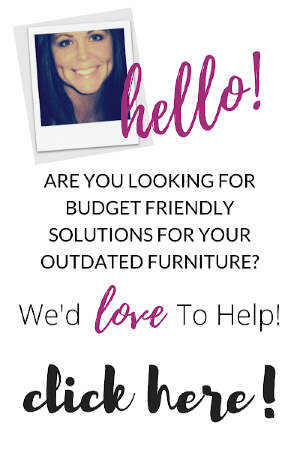 Furniture make-overs make me happy! Thank you for sharing with us over at the Welcome Home Wednesdays Link Party! Oh thank you, Lisa! I'm honored! You've got another winner, Carrie! 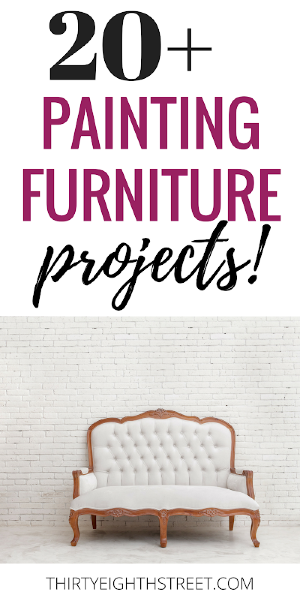 I think I'm playing favorites because I'm featuring you again tonight but I can't help but love a good furniture project. Gorgeous! 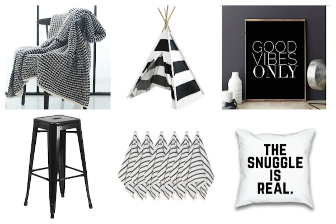 Thanks so much for linking up with us at Best of the Weekend. Your comment made me giggle, Jenna! :) Thank you! I appreciate you sharing another one of our pieces again! Wow! 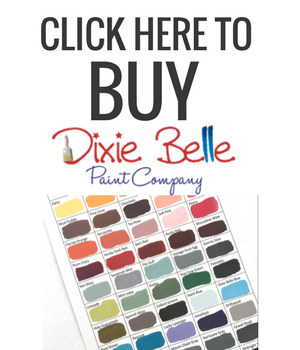 I just love this post and am featuring today on The Painted Drawer. Thanks so much for sharing! I just love a great upcycle! Guess what! 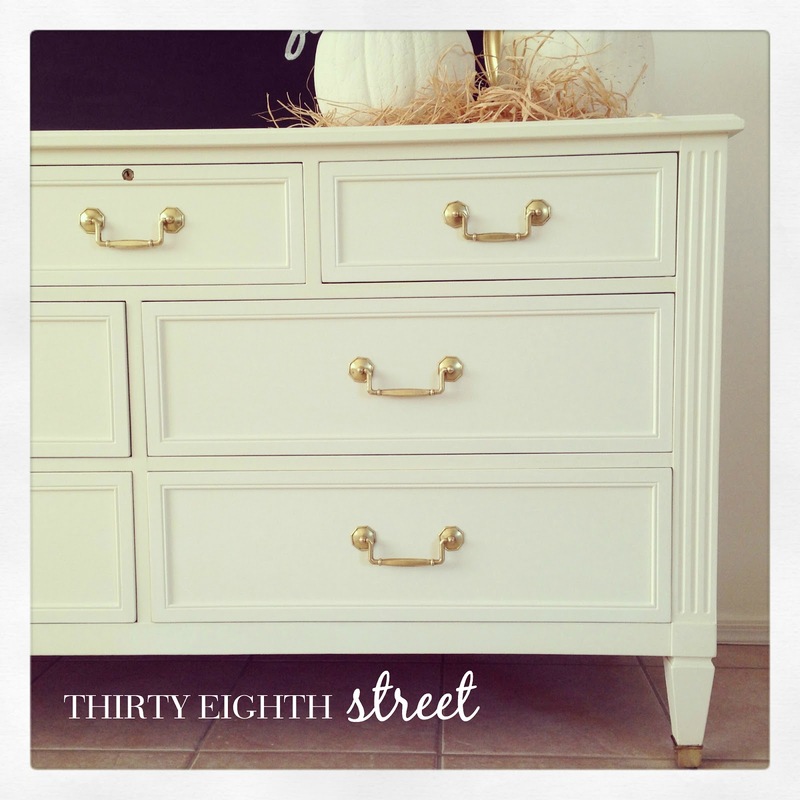 I loved this dresser so much that I chose it to be featured for this week's The Beautifully Creative Inspired Link Party. :) Go grab a button you deserve it! I'm glad you liked it! Thank you for taking the time to visit us!